Reports from Italian media indicates AS Roma are in view of alternative option against the proposed signing of Steven N’Zonzi this summer and are considering Arsenal’s Granit Xhaka instead. 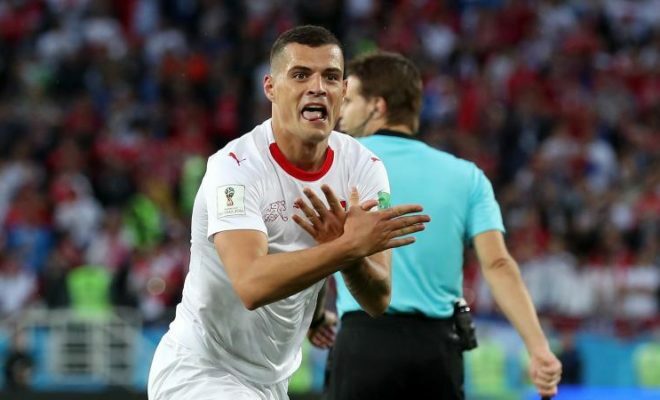 According to an Italian journalist Alessandro Austini of IL Tempo, The Italian club are very much interested in signing Xhaka before the end of summer leaving the option of signing Sevilla’s N’Zonzi. N’Zonzi was recently linked with a move to AS Roma with a release clause worth €40million but Roma don’t appear to be able to hand out that kind of amount and would prefer to look elsewhere. Meanwhile, the recent interest in Xhaka might not materialise as new Arsenal Coach in a bid to make changes and put all options at bay has offered the player a new deal that will last for five years and in addition, offered him the captaincy title of the club during Arsenal’s pre-season friendly match played against Lazio. Xhaka future with Arsenal seem unclear though due to the fact that the new coach might either want to try out the old options left for him by former coach Arsene Wenger. However, if Emery decides to put Xhaka up for sale, the price will be on the high side following the recent five-year deal offered and it doesn’t appear AS Roma are willing to come up with a high amount for a player.